The blaster as displayed looks great, from the bolt action and long barrel to the faux scope on top. In fact, the scope is at a slight angle, so that when held up to your face the barrel will point up slightly. In the stock of the blaster is a small compartment, with storage space for four darts. The bolt-action priming mechanism works smoothly, and opens up a large space to insert your next dart. You simply put in the dart and slide it back into the bolt onto the dart peg. 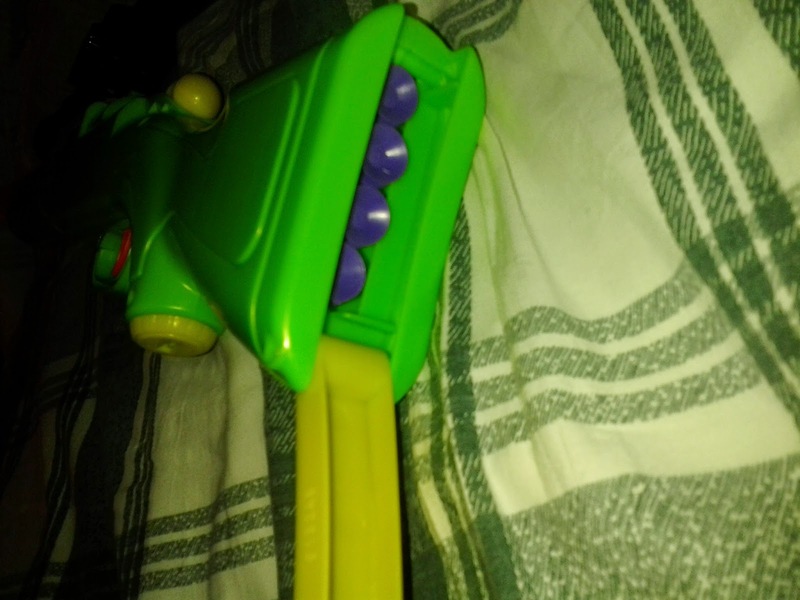 The blaster will not fire unless the bolt is put back into the closed position. When we open up the Predator, however, things go downhill pretty quickly. 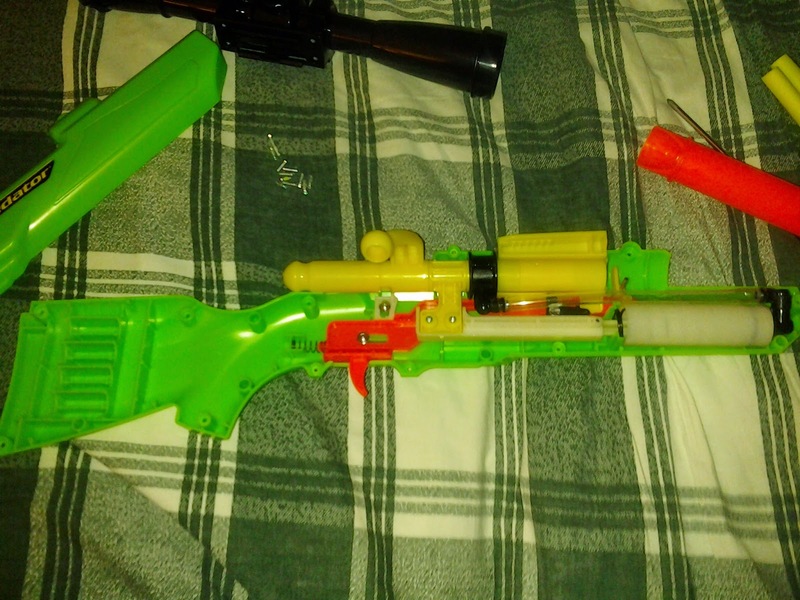 Blaster manufacturers tend to reuse existing internals (if you have something that works, changing it just means an extra cost), and Buzz Bee is no exception. In this case, though, it's an outdated setup that's being reused. Here's a slightly closer look. 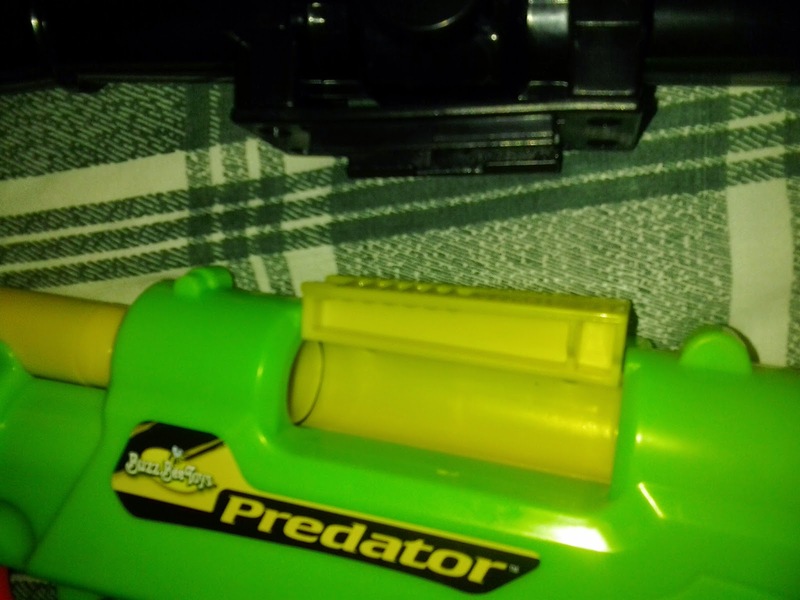 Just as in the "rifles" before it, the Predator has a plunger tube all the way up in the front, with a tube running to the back of the dart chamber. This completely kills any hope for long ranges, due to all that dead space between the plunger and dart. Quite frankly, if Buzz Bee wanted to up the ante, they would do the opposite and have the plunger tube under the dart chamber, facing backwards. It would be connected to the bolt so that on priming, you pull the tube (and catch) back, and then on finishing the arming motion move both plunger and tube forward. 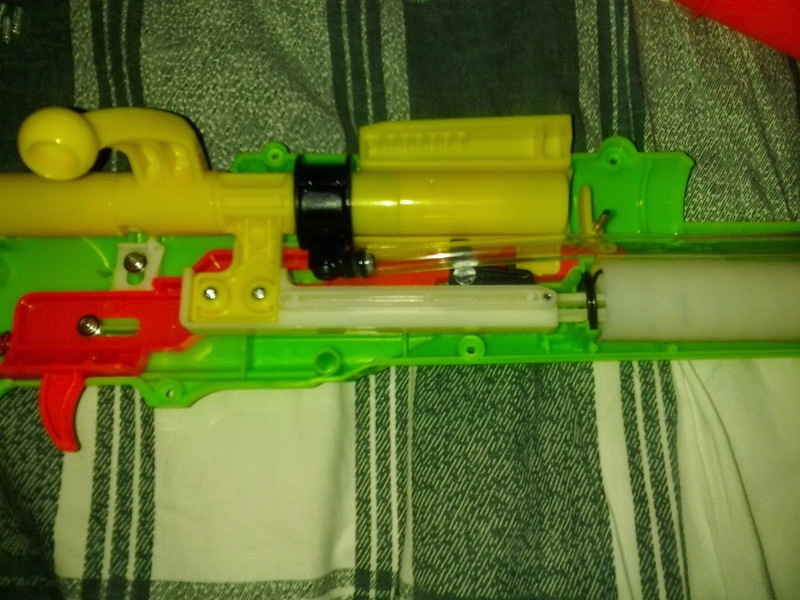 A little more plastic reinforcement, as well as a cap on the back of the plunger tube would be needed, but you'd have the air outlet right beside the back of the dart chamber. Slightly more complex, but far more efficient. Finally, I tested the blaster. As expected, performance was subpar, with shots fired level grouping together at the 30' mark, and angled shots only making 50' at most. 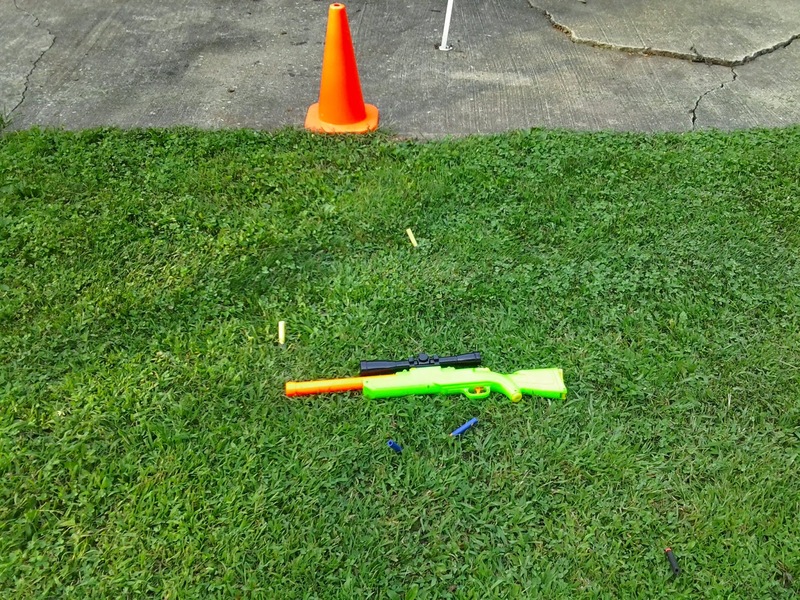 Shots were made with both the included Buzz Bee suction cup darts and Nerf Elite streamlines. The Predator is a little kitten pretending to be a lion. It looks great, but lacks the oomph to make darts fly very far. The rate of fire is horrendous (not unexpected, since it's a bolt-action, hand-fed blaster), which in itself isn't bad so long as you can actually hit your targets a long way off. The fact that it was near both the Air Max 6, which boasts doubled ranges for the exact same price, should be enough to signal even stock blaster users to stay clear. EDIT: Some people will question why I gave this an F, but gave a great recommendation to the Gunsmoke, which boasts similar performance. I still maintain that position, seeing as Gunsmoke is marketed primarily as a performance piece, while the Predator is still marketed like the rest of the Air Warriors brand as a blaster. They might as well have the same setup but move the plunger tube back to the trigger area and alter the trigger, would be a lot more efficient. how the heck you managed to get 30 feet with this piece of crap I don't know, but it is a hopeless cause. It's not even worth scrapping for parts. 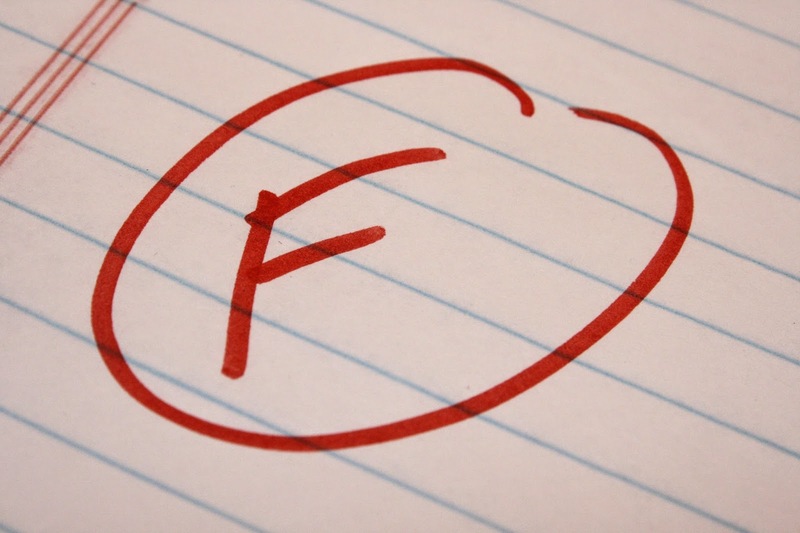 Please warn your readers that this ain't an F. It's a Z-. I have one and the scope isn't angled but they are terrible. 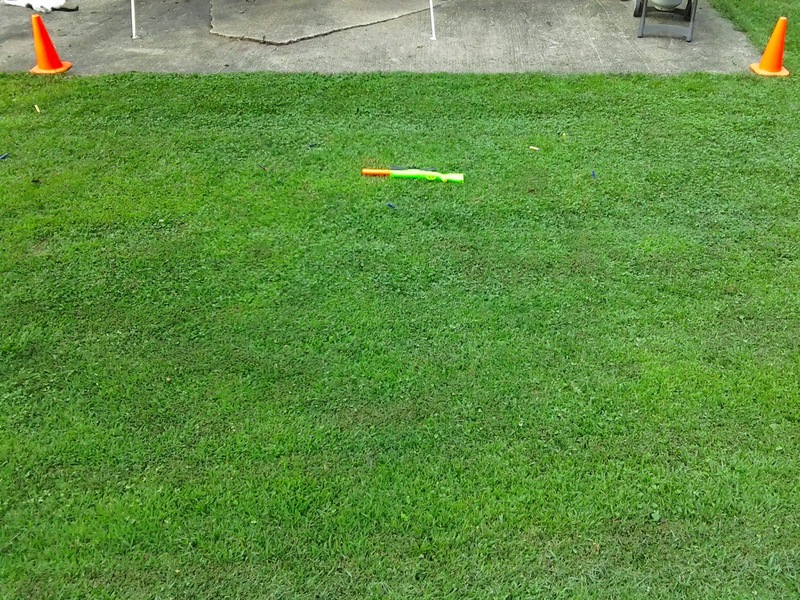 Can streamline darts fit in the nerf predator ? The scope is pretty cool. 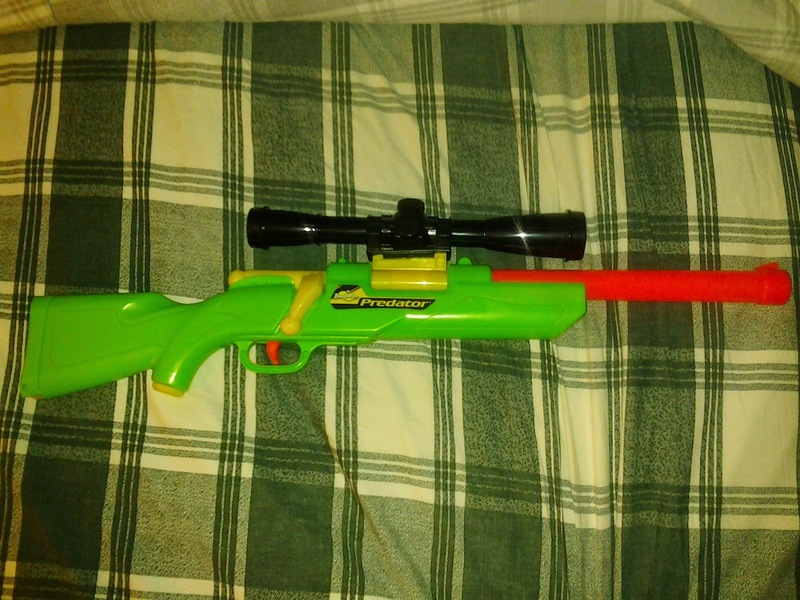 Nerf should make some scopes like that. Good for imaginary sniping. In reality, the gun is craaaaaaaap. Wow it's excellent playing hunting gear like rifle. Here is excellent training for indoor hunting. It is very important to increase our hunting skill. We should train up our child how to hunting from childhood. Some one practice about hunting from childhood they will be great hunter in future.